Jack's Opinion: Adobe Wallaby right now more Wanna be. Adobe released there prerelease verison of Wallaby. 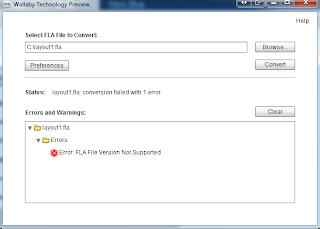 Wallaby is a tool to convert FLA files into html. The diea is to help designers to build still their work in Flash (FLA) and then to export it either to swf for browsers which are supporting swf or to export it to HTML for devices like iPhone or iPad which don't support flash. I did not find yet a good tool to do this, but this would be a killer app. Download and install was easy, however most of the files were not be able to convert and it creates for graphics many times svg files (scalable vector graphics) which are only supported in Chrome and Safari right now. IE 8 can't display them (but IE 8 does anyway not support HTML 5) and it did not work for me with Firefox 3.6.3. The results are poor and the support of html is very small see list below. Overall i am right now disappointed with Adobe. The tool does not do a lot but hopefully more will come. A big company like Adobe should be better with their tools. The few things which are supported are as easy and better done manually through HTML tools. With most of the FLA files are even not supported to be converted. Right now i would give Adobe Wallaby a D-. Tweening - Shape Complete One SVG file is created for each frame of a Shape Tween. This can cause a large number of SVG files for complex animations using Shape Tween leading to playback performance issues on iOS devices. Some of the complex cases may not convert correctly. We currently emit both Classic and TLF text as SVG text blocks which are included in an HTML wrapper. This provides generally good mapping of the FLA features to HTML/SVG but there are a variety of issues. Font embedding is done by use the SVG font mechanism. •No support for different anti-alias modes like FLA provides. This is a Flash Player feature that has no support in HTML.